"Daniel and the Lion's Den" from Where's God When I'm S-Scared? Larry takes on the role of Daniel in this classic Biblical retelling, where Larry bites off a bit more than he can chew! Because of the King's deceitful wise men, poor Larry finds himself trapped and deep in trouble. But as he is imprisoned in the lion's den, Larry still finds that he is still in God's hands. David and Goliath turns into Junior Asparagus vs. a really, really, really big pickle!!! This story shows that, with Gods help, size doesn't always matter and that the small guy can conquer big things. With the weight of the world on her shoulders, Esther has high expectations from all of her people, but she is struggling to find the strength to please everyone. Being afraid isn't a bad thing and that you need to do what is right. Making that decision could be the hardest thing we may have to do but it is the strength inside all of us that make us do it. This DVD is Region 2 and will play on a UK DVD player. Heroes of the Bible Volume 1 DVD by Veggie Tales was published by Authentic in March 2011 and is our 1584th best seller. The ISBN for Heroes of the Bible Volume 1 DVD is 5060256820451. Be the first to review Heroes of the Bible Volume 1 DVD! Got a question? No problem! 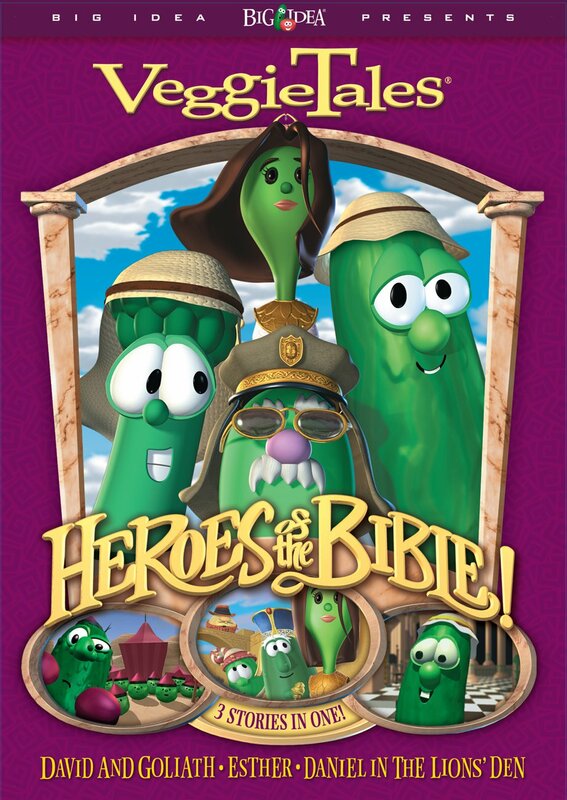 Just click here to ask us about Heroes of the Bible Volume 1 DVD. How long does each story last? A:Each story is close to 25 mins long. Thank you for using the Q&A forum.